I had no idea how the project would perform on Day 1. I wanted all backers to feel like their pledges contributed towards making the game bigger and better, but I also didn’t want to blow through all stretch goals out of the game if I underestimated Day 1 funding. I wanted to give each stretch goal the attention it deserved. I learned this the hard way on the Tuscany campaign, where we raced through almost 10 stretch goals on the first day. It greatly diminished the excitement for each of those goals because they were all lumped together as “achieved”. I wanted to sustain backer engagement and entertainment throughout the campaign. Without knowing the daily average in advance, I had no way of calculating the best way to spread out the stretch goal thresholds. The method I tried using was that every day I would reveal a new stretch goal, and threshold would be based on the funding level at the time I announced the goal. Backers didn’t respond well to this method, so on Day 3 I converted to a traditional stretch goal system. I regularly revisit the topic of stretch goals on this blog–including a post a few months ago–but I’ve never been able to figure out a functional iteration of this “daily goal” system. Fortunately, I believe that another creator has cracked the code. 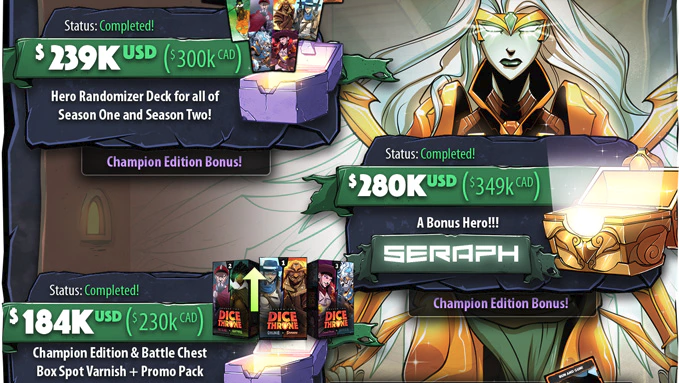 Gavan Brown of Roxley Games recently launched a Kickstarter campaign for Dice Throne Season 2. It uses a system he calls “funding quests,” and I think it addresses all of the concerns I mentioned above (and more). The basic idea behind the funding quests is that Gavan reveals a new goal every day even if the previous quest is incomplete. This gives him an opportunity to spotlight each goal while always giving backers a sense of progression (the status bar under each incomplete goal helps with the progression). He also hints at the focus of upcoming quests. He doesn’t have a preset list of funding quests with associated amounts. He has a list of things he would like to add to the game (and that he’s researched and budgeted), but the list is totally dynamic. He often chooses which quest he will run that day on that very morning. 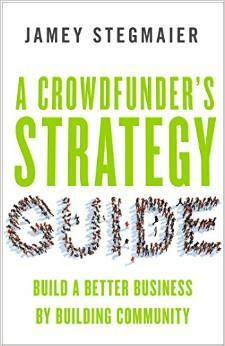 He analyzes every idea that he hears from backers and almost always discusses them. If he hears an idea for a funding quest that is better than one of the ones he has, he will add it to his list, which will often replace a different funding quest. He has done this several times during this campaign. Because the funding quests are dynamic, so are the costs and effort involved to fulfill them. As such, the funding required for each quest is set when the quest is launched. 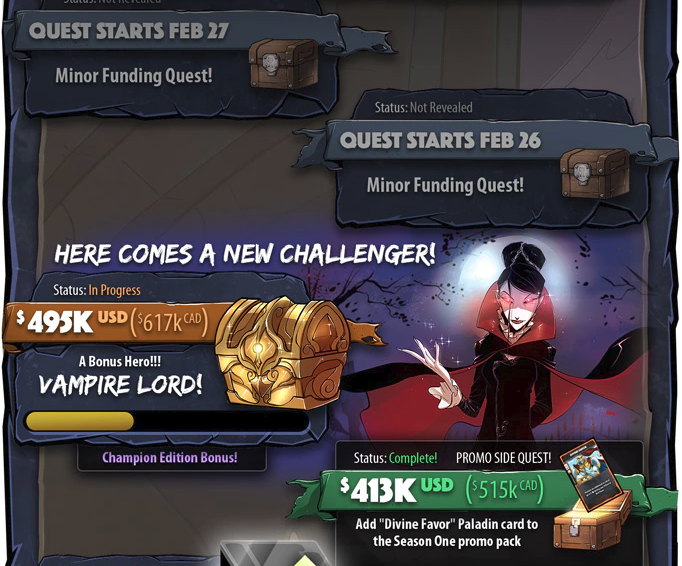 New quests always require some amount of funding to accomplish. He wants his backers to be able to complete the quests in a reasonable amount of time, so all funding quest goals must be attainable. When setting the amount required to complete the day’s Funding Quest, Gavan considers a variety of factors, including: the current state of the campaign, the number of days left in the campaign, the FQs that he still has on the docket & the one’s suggested by backers, as well as the labor and hard costs of executing any particular FQ. It’s hard to pinpoint if this method has led to the campaign’s success, as there are many factors in play, but it would appear from the daily funding average ($24k/day on the “middle” days 3-13) and the daily comments average (182/day on the middle days) that funding quests are sustaining the excitement and engagement during a time when many campaigns flounder. Overall, I love this concept, and I actually think it meshes well with the Root Method I discussed a few months ago. What do you think about the concept of “funding quests”? Have you seen any other projects do something like this? I think that’s a very interesting and fair concept. I haven’t tried funding a game yet, but I have backed several games, and have been critical of one or two approaches to stretchgoals. Some creators don’t use them at all. So for me, this method is preferable to see as a consumer. I t makes me feel like the designer is being transparent, as well as realistic with their goals. I then have confidence that they are able to scrutinize important details and that they have put that same detail and scrutiny into their game. For me, how a designer handles stretchgoals kind of represents that designer’s mindset to me. If they set stretchgoals way too high, is it due to arrogance or naivete? Same for waiting until they have funded to set stretchgoals. If they set too many, are they stretching themselves thin or setting themselves up for a long delay? Before I back a game, I consider these things as equally as I consider updates, comment responses, and page presentation. So for a person to use an organized and exciting system like this, I would have all the confidence that I would be getting a quality product. Sorry for the long comment. Fertessa, I agree with your excellent comment! ?? Fertessa: I like the core principles you mention here: transparency, realistic, scrutinized, and organized. I didn’t think anything at first because I was try to understand it without having all the comments against it cloud my judgement. After a few days though I really was in favor of it and posting positives about it and saying give it a chance. Now that we been through a lot of the campaign I hardly see any comments on it, even new backers (guess they see all achieved). I really wish that another creator will ‘stir the pot’ and maybe more will try it and it changes the whole Stretch Goal aspect of Kickstatter. In the end it accomplishes the same thing but it’s the why and how you get there. All comes down to your mind set. I came to KS to help others achieve their goals and saw it as being the most helpful to pledge with so many others. I admit, there has been a couple times I got wrapped up in the more,more,exclusives and what-have-you but always came back to my truth of being there. Sometimes people don’t see their behavior or (sadly) that is them. Few companies,I don’t say creators as my past 222 funded projects haven’t seen it done by individuals, they prey on the bad side of people.it creates a campaign that I just feel dirty. Everyone is all snarky with their comments,completely rude and threatening to renig their pledge,down right ordering to be given or change something, foul language and inappropriate posts that should be handled privately.I believe a lot of it is anticipated and provoked.I won’t name as it’s my opinion and dont want to talk bad of but many a campaign I choose not to follow.As with retail also because of their business model. Throughout this DiceThrone campaign so far I have felt nothing but good. The community has been respectful to each other and the whole DT team.And Nate, Manny & Roxley have been amazing these past 3wks. Nothing but love of board games during and after their campaigns. They’re going to change things. They may not intend to and it may be slow but their passion for gaming is going to take us all on a heck of a ride, I don’t want to miss. Jonathan: It’s interesting that you associate stretch goals with some of the ugliness that can manifest in the comments (and I agree that it’s often a source of that ugliness). I wish it weren’t that way, as creators often offer a ton of great, beautiful, and interesting elements in the core product itself. I’m glad the community in Dice Throne has been respectful. 1) “Stretch Goals” are such a foregone conclusion in every campaign, that it was VERY difficult to get backers to wrap their mind around it in the first 48 hours. If someone else wants to try this, I would recommend having a more thorough explanation of what Funding Quests are (and how they differ from SG’s) written in great detail in the FAQ or at an external link. Change, even when it’s for the better, is hard on people. So, there was unnecessary frustration in the comments within the first 2 days. Now that we are two weeks in, we regularly receive comments about how superior this system is. Nate: Thanks for sharing these insights! I agree that it can be difficult to teach a new concept to backers. And that’s a clever note about a non-linear visual metaphor since goals might appear out of order based on the funding quest system. 2 thoughts leapt out to me as I read Nate’s comment above, the first was instead of the staircase, how about say a bookcase consisting of 3 shelves, one for Minor, Medium, and Major FQs. Have however many books on each shelf for the number of each type of quests and then take one at random off the shelf for that type of quest when one is achieved. On thinking about that, it then morphed into a totally different idea of using something like those puzzles that you slide around to reveal the picture but instead you reveal parts of the picture each time a funding point is reached and backers get a glimpse of what the goal might be, not sure how that would be taken though unless you give a vague hint eg this goal will be component related, this one will be event related if the game has events. Each covering square could have an associatted value (10% of the goal step say) and/or a time, so it is either removed by the funding being in place or a certain amount of time passing, but the underlying goal will have a funding target. Sorry for wall of text, out pouring of random idea. As a season 1 backer, season 2 backer, and having backed 50+ campaigns in the last year, I will add my half a cent. I hated the FQ when they were revealed, mostly because of a lack of understanding. Now that I have a better grasp of them, they are much more enjoyable, and I do look forward to the reveal every day. I think that a lot of backers have expectations that are tied to stretch goals, and the most important is the mindset that they are getting something for free. People love free stuff and blowing that mindset up in any way is guaranteed to have some type of outcry. I would also say, changes like this should come from a successful creator/game (Dice Throne followers have freely imbibed on the Kool-Aid, lets say) and the community has embraced the game in a way that truly allowed Nate, Manny, Gavan, and the rest of the team to try some really unique stuff. This is a super cool idea! Maybe we’ll give something similar a try on a future campaign. I would caution newer creators that, as fun as these are for your backers, your first priority is making sure that the increase in costs for your stretch goals (including manufacturing, box size, shipping, platform fees, etc.) must be covered by each goal. If your goals don’t and you have a lot of stretch goals, you’ll find your project costing way more than your actual funding and you’ll need to find funding elsewhere to make and ship your games. I just see a daily (or frequent) reveal could allow a creator to get carried away, especially if your funding isn’t keeping up with the reveals. Thanks for sharing, Jamey! I love this system. It takes the true meaning of stretch goals and helps explain to the backers that these things we want to add to our projects are not free and are not without risk. I think anything we can do to help educate backers with what it takes to pull off projects is wonderful! I know when I launched my first project (Barnyard Roundup) I had a lot of preconceived notions from being a backer of the system but all of those things shifted and changed once I was on the other side of the platform. I will be watching the Funding Quests structure closely as a way to engage and build our projects. What do you think of NSKN’s achievement system for Dice Settlers (I assume the project is on your radar as they are using your realistic resources)? Funding goals that only are achieved if they are met within a certain time is an interesting. I haven’t seen any negative comments yet, but it isn’t a campaign with a lot of active commenter. I’ve seen that part of the project, but I’m not sure I understand it. Are they all tied to time, or only some of them?